The following 10 principles are our general ideas, guided by the research of Piaget (1975/1985), about how children think and learn best and are detailed in our book Ramps & Pathways: A Constructivist Approach to Physics with Young Children by DeVries & Sales and published in 2011 by the National Association for the Education of Young Children (NAEYC). ramps but with almost any early childhood activity. 1. Before introducing ramps, experiment with materials to experience challenges and learning opportunities. 2. Inspire children's interest by introducing intriguing materials such as ramps and pathways at group time or during activity time. 3. Create a safe environment that inspires children to have ideas and figure out how to do something. Children need to know that making mistakes is simply part of the process of learning. 4. Allow children to try out their ideas even if they will not work. It is through testing ideas that children learn what will and will not work. Using that information, they can think in more complicated ways. 5. Observe children's actions to understand and assess their reasoning. Because children's actions can reflect their thinking, they provide clues for adult interventions. 6. Intervene with questions and comments to encourage children's thinking. When children are constructing their own problems and figuring out successful solutions, they need little intervention. Often, however, adults can ask questions or make a comment that will focus children's thinking and increase awareness of the results of their actions. Questions such as, "What are you trying to make the marble do?" "Show me with your finger how the marble will go." "Is there anything you can change to make the marble . . .?" can be very successful. 7. Do not pursue if a child does not respond to an intervention. Sometimes interventions inspire children's thinking and sometimes they do not. When children ignore an intervention, they probably have other ideas they are trying to figure out. When teachers push their own agenda children sometimes give up and are no longer interested in the activity. 8. Support children's work with representations and/or discussions of ramps and pathways. Photography is an excellent tool for capturing and saving images of children's structures. In the course discussing and representing children's work, they have an opportunity to reflect, enrich, and share their knowledge with others. 9. 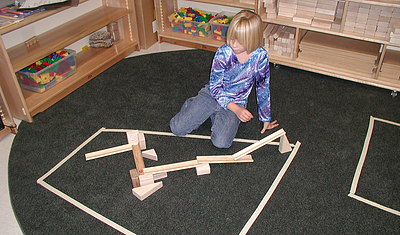 Integrate all curriculum activities into Ramps and Pathways. Talking, writing, and drawing about the activity are easy ways to integrate other academic areas. 10. Encourage social interaction. We believe that cooperative relationships are necessary for optimal intellectual development! Ramps & Pathways: A Constructivist Approach to Physics with Young Children, authored by Rheta DeVries & Christina Sales and published by the National Association for the Education of "Young Children (NAEYC), Washington DC, 2011. National Science Teacher's Association (NSTA) and the National Association for the Education of Young Children joint position statement: Early Childhood Science Education. Most importantly, remember try very hard to allow children to solve the problems for themselves! Dr. Sales is available to present workshops on the use and benefits of Pattern Block Puzzles, physics activities for young children, classroom atmosphere, conflict resolution, and other constructivist approaches to early childhood curriculum.